We're blessed with some truly visionary film directors working right now: Ridley Scott, James Cameron, Steven Spielberg. All three of these have created movies with visual grandeur and innovation. James Cameron's Titanic was unforgettable for its sinking behemoth, and his Avatar was one of the most beautiful films of all time. Likewise Steven Spielberg with the opening invasion scene in Saving Private Ryan and the terrible imagery of Schindler's List. Ridley Scott's futuristic work, like his just-released Prometheus, puts him in their company for sure. These are great filmmakers because they are visual artists of the highest rank. When you recall their films, you see images: the soldier picking up his own severed arm in the shallow waters of Normandy, the one child highlighted in color in the otherwise black-and-white Schindler's List, the dank, dripping menace of Aliens. But another thing unites these films: their terrible scripts. At best, they are forgettable: It would be hard to recall a single line from any of the movies mentioned above. At worst, they have sappy dialogue, cliched characters, and plot developments that can only be characterized as stupid. Would any scientist in the 21st century have the wide-eyed optimism of Prometheus's Shaw and Holloway? Would any technician, finding himself stranded in an extraterrestrial underground cavern suddenly squirming with snakelike life forms, bend his face right down to it and say, "What a cute little fella!"? 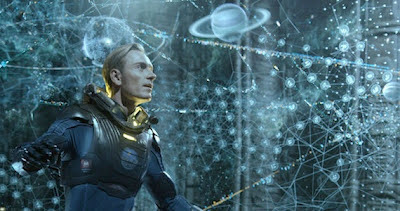 The characters in Prometheus, however, are victimized time and again by their naivete and stupidity. They are amazingly unconnected from each other, with intruders walking the halls and terrible sicknesses ravaging them completely unbeknownst to the other characters. There are only 17 people on the ship, and you think, "Where IS everyone?" No one seems to have any sense that a shipmate who is sweating profusely with bloodshot eyes might be in danger. The only two scenes in which a character rallies to action are when Charlize Theron's character grabs her flamer and goes down to stop an infected crew member from reboarding. As the others urge her to let him on board ("we can still help him! "), she pulls out that sucker and blasts him. So frustrating were these characters that I inwardly cheered at his death. The other scene was when Noomi Rapace's Dr. Shaw, making a terrible realization under great physical stress, makes her way to the surgery and . . . well, I'll leave it at that. It's a fairly long sequence, and one that should have served as a template for the rest of the film, combining horror, drama, action, and intelligence in a way that had you rooting for the character rather than rolling your eyes at her. More of that, please.